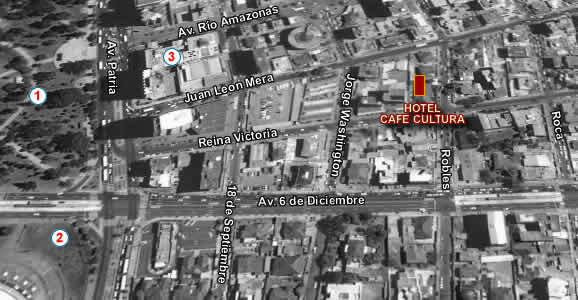 The Hotel Café Cultura is located in the La Mariscal, tourism and entertainment center of Quito. Just 10 minutes from downtown of the city and 15 from the airport. From here you can easily turn to all sites in the city. The Hotel has a post-colonial building of two stories, with their traditional white walls and red tile roof. It is surrounded by a lush garden with distant places to sit and relax watching the hummingbirds residents play among the flowers and be themselves. Coffee Culture has 26 rooms, all individually designed in keeping with the style of the house. Different artists have painted frescoes in all areas of the hotel, adding to its unique creative style of Cafe Culture.